SoundCloud boss Kerry Trainor claimed last year that the streaming company generated more than $100m in 2017 – and it turns out he was good as his word. Berlin-based SoundCloud has just filed its 2017 accounts with UK Companies House, and MBW has crunched the numbers. SoundCloud’s global revenues in the calendar year hit €90.7m ($102m), increasing 80% on the €50.3m it posted in 2016. Within that figure, subscription revenues (covering users paying for a Pro/Pro Unlimited upload account, as well as users paying for a SoundCloud Go/Go+ listening account) nearly doubled, up 89% to €72.6m ($82m) from €38.4m in 2016. Advertising revenues grew 53% year-on-year in 2017, up to €18.1m ($20m). Some 71% of SoundCloud’s total revenues in the year were generated in the United States, compared with 69% in 2016. 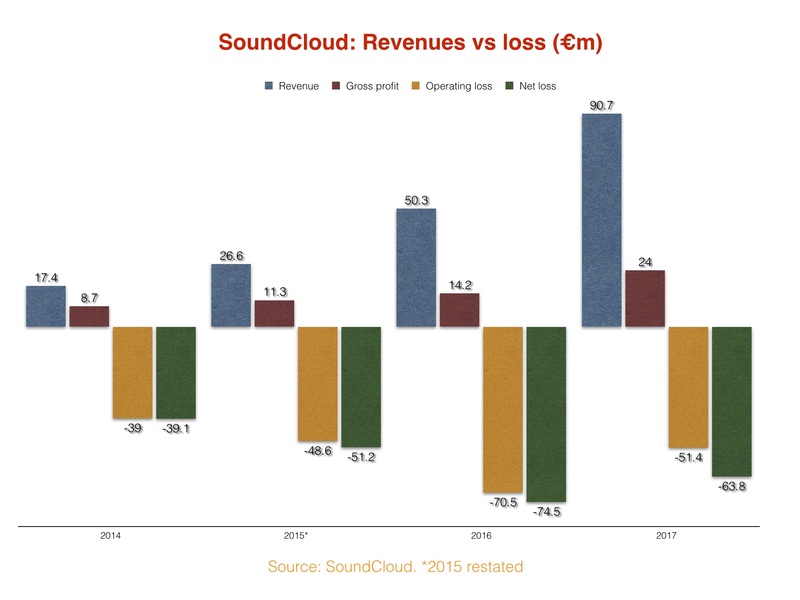 Perhaps the brightest sign for SoundCloud within its 2017 accounts was a significant improvement in its annual operating loss, which narrowed by 27% to €51.4m ($58m) – compared with €70.5m in 2016. These numbers reflect a transformational year at the company. In summer 2017, SoundCloud received $170m in a funding round led by Singapore-based Temasek and US-based The Raine Group, while it named ex-Vimeo exec Kerry Trainor as CEO. Ahead of these announcements, the firm closed offices in London and San Francisco and axed 40% of its global workforce – with approximately 173 jobs going as a result. Following this painful adjustment, there now appears to be happier times on the horizon for SoundCloud. The firm’s FY2017 fiscal filing reports: “Since the August 2017 financing and throughout 2018, SoundCloud has taken significant steps to improve its financial health including retiring all outstanding debt, reducing certain fixed operating expenses and cash flow burn, improving its cash collection processes and renegotiating certain rights holder contracts. SoundCloud’s net loss for 2017 stood at €63.8m ($72m), though this was significantly affected by one-time cash expenses related to its recapitalization. SoundCloud ended 2017 with 214 employees across its Berlin, London and New York offices. The majority of these people had technical backgrounds. 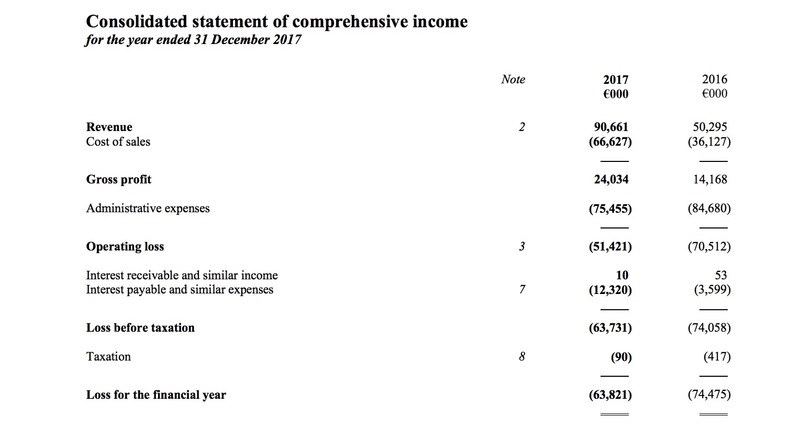 A SoundCloud spokesperson told MBW: “SoundCloud’s 2017 Annual Report filed to Companies House reflects a pivotal year in which the company fully recapitalized for sustainable growth, while achieving substantial revenue growth and loss reductions vs. 2016. “While 2018 results will not be filed until later this year, we are pleased to report SoundCloud also surpassed its full year 2018 growth plan, building on the 2017 improvements posted today.